In a Forbes article discussing the 10 reasons the smartest employees are underperforming, poor time management skills was listed in second place behind a lack of incentives. Poor prioritization of tasks is a major failing that can cause even your most talented to be an underperforming employee. This not only harms their career, but also damages team performance. Therefore, coaching effective time management techniques should be part of an organization’s training regime. In this article, you’ll learn about the Eisenhower Matrix – a time management tool that will help individuals and teams perform to their potential. The job of President of the United States may be the biggest job in the world, and it is one that certainly presents unique challenges to the President’s time. When he became President in 1953, Dwight D Eisenhower developed a technique to manage his time better and ensure that he attended to all priorities. At the heart of his time management system was his stated belief that “What is important is seldom urgent, and what is urgent is seldom important”. The system had to be simple, easy to use, and effective. What he developed was the Eisenhower Matrix (also known as the Urgent/Important Matrix). i. Is the task important – a task that will aid goal achievement and push outcomes? ii. Is the task urgent – one that requires ‘immediate’ attention? 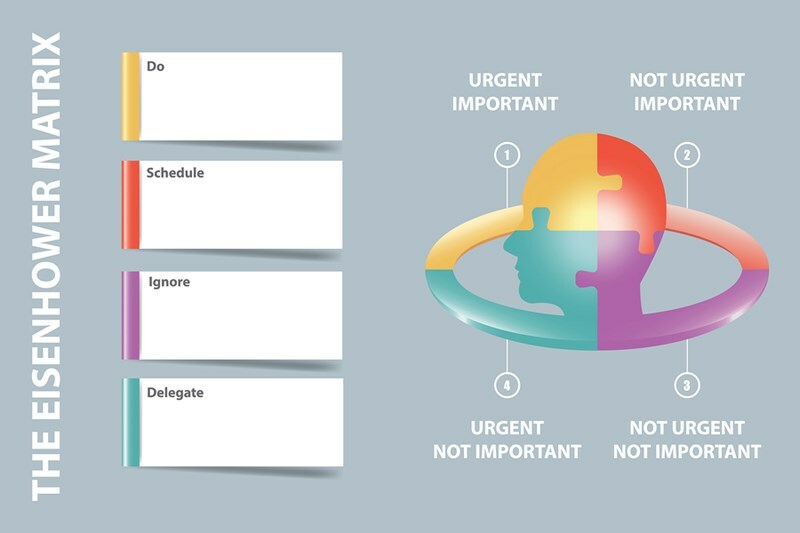 Having placed your to-do tasks in the appropriate quadrants, you will know which tasks you should be doing, those you should be delegating, and those you should be discarding. How do Eisenhower’s quadrant’s work? In this quadrant, you will commonly find tasks that are at crisis stage because of time. Failure to do these tasks will result in negative consequences and underperformance. They may also affect other tasks, other employees, and the team effort. The objective is to keep this quadrant empty. Employees who underperform are likely to spend most of their time on tasks in this quadrant, and therefore looking busy while producing poor results. In this quadrant are all the tasks that move you toward your goals. This is where most of your time should be spent – on the important tasks before they become urgent. Highly productive employees spend the majority of their time doing the tasks in this quadrant. Tasks in the third quadrant are urgent, but not important to you. Again, underperforming employees will spend considerable time on these tasks. This is because they feel important because of their urgency. These may be tasks that are important to other people. Clear these tasks out of this quadrant by either delegating or discarding. Finally, we arrive at the quadrant in which tasks are neither important nor urgent. The time wasters. These include things such as so social media, email (a tip is to check email twice daily), playing video games, and watching television. This is the quadrant to avoid. Plan the week ahead, prioritizing tasks in quadrant 2. The more time spent here will result in fewer tasks in quadrant 1. Leave time for unavoidable emergencies. If none occur, you can fill this time with tasks from quadrant 2. Delegate or discard tasks in quadrant 3. Discard all tasks in quadrant 4. If there are tasks in quadrant 1 that are important to you, then do these as soon as possible. Be proactive in preventing tasks moving from quadrant 2 to quadrant 1. If your team has an underperforming employee, take time to understand why the underperformance exists. There may be a need for specific training, cross-cultural management challenges to be overcome, a lack of understanding caused by poor communication, or internal conflict that needs to be care-fronted. If the problem is caused by poor prioritization and time management, coaching the Eisenhower matrix should improve individual and team productivity an help personal and organizational goals to be achieved with greater certainty. To learn more, contact Forward Focus today.